Billing & Payment Information: The Billing & Payment Information which we collect shall not be disclosed to any third party, other than for legal reasons implied in the transaction. The billing & payment information you have voluntarily provided while purchasing online has been registered. This information is used to process your order and could later be used for further promotional marketing purposes. As part of our marketing policy to advise you of any other offers of related products or services, we may allow other departments of vigo4u co .ltd, and the group to which it belongs, to have your name and address and/or email address. Communication Services Information: We may use your Information to provide services that you request or to contact you regarding additional services about which vigo4u co .ltd determines that you might be interested. Specifically, we may use your email address, mailing address, phone number or fax number to contact you regarding notices, surveys, product alerts, new service or product offerings and communications relevant to your use of our Site. We may generate reports and analysis based on the Information for internal analysis, monitoring and marketing decisions. We reserve the right to disclose your Collected Information to relevant authorities where we have reason to believe that such disclosure is necessary to identify, contact or bring legal action against someone who may be infringing or threatening to infringe, or who may otherwise be causing injury to or interference with, the title, rights, interests or property of vigo4u co .ltd, our Users, customers, partners, other web site users or anyone else who could be harmed by such activities. 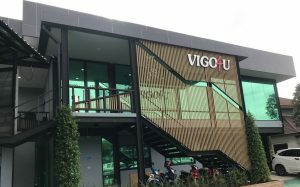 If we have a reason to believe that a particular user is in breach of the terms and conditions or any agreements with us, then we reserve the right to make public or otherwise disclose such user’s Collect Information in order to pursue our claim or prevent further injury to vigo4u co .ltd or others.